A recent law graduate whose Allen & Overy vac scheme led to a training contract has taken to YouTube to share her tips and advice. Soon-to-be Legal Practice Course (LPC) student McGing gives her advice as five key tips. These include taking “extensive notes” during the work placement and asking for help if you need it. Her bonus tip is to go easy on the alcohol: “This is not a night out with your friends”, she says of vac scheme social events. McGing’s video, which you can watch in full below, focuses on her “phenomenal” week-long winter vac scheme at Allen & Overy, during which she sat in the firm’s competition department. She has also completed work experience placements at the likes of Berwin Leighton Paisner (now Bryan Cave Leighton Paisner) and Handelsbanken. McGing is far from the first YouTubeing lawyer. Chrissie Wolfe, a solicitor at Irwin Mitchell, runs a vlogging channel called Law and Broader which is “aimed at law students or anyone trying to break into the legal profession who is interested in improving their employability”. Wolfe’s ten-minute clips cover everything from law fairs to effective time management. Also YouTubeing is University of York law student Ludo Lugnani, whose daily videos give viewers a quick-fire commercial awareness update. Lugnani is seeking a training contract, and says making the videos helps him keep on top of current affairs. But who says lawyers have to vlog about law? 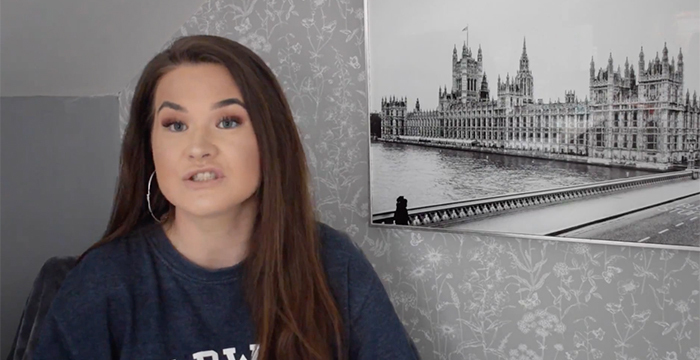 Katherine Baker, a law student at Durham University, runs a YouTube channel called BeuatyByKat08, which covers topics such as fitness and life advice. Baker, whose channel has almost 30,000 subscribers, will be commencing a training contract at Fried Frank in 2019. This is very kind and will hopefully be very useful. It has brightened my dull morning. Serious question. Have Jones Day been in touch with LC to moan about the (free?) publicity they get in LC comments? Noticing that you have taken to censoring the name as well. So her “bonus tip” is to go easy on the alcohol? If you need to be told specifically not to drink yourself into a stupor while your prospective employers are watching, I’m not sure you deserve the job…. She hasn’t even started the LPC yet for gawds sake, and here she is dispensing wisdom about the ‘legal profession’. No, you’re not. Get off your high horse you troll, there’s literally hundreds of other Magic Circle future trainees who don’t go on and make these pathetic YouTube videos. Also , stating she was not interviewed at the end of her Vac Sceme is not usually the norm ( at A &O ) , I know that at the end of one Vac Scheme all were interviewed for a TC , along with ongoing assessment. Um so what’s actually going on with legal cheek? No more news roundup??? Isit just one article a day now? To be fair, Alex is possibly finding it difficult to replace Katie….lol. It’s a very demanding job, with many skills needed (copy & paste, thorough knowledge of law & legal profession blah blah……). I’m surprised though as the perks of the job – being slagged off and insulted daily by people on this forum – are hard to beat…..
Someone’s already said it but I’ll say it again; LC has deteriorated. E-Petition to bring Katie king back. These small time magic circle narcissists will be the first ones to collapse through attrition. First to be bounced off partnership track. In for a rude awakening. I wasn’t going to reply to many comments on this but this is quite literally not true so please don’t write defamatory comments about me without fact checking first; thank you! ROFL, I remember hearing about this! Wonder what A&O think about this ? They themselves have you tube videos with trainees / associates etc giving great advice . How these children who have barely started their LPC can make such grand gestures of delusion is beyond me. She’s insufferable. Her endless posts on LinkedIn dispensing ‘advice’ on making it in the legal profession always appear on my LinkedIn wall. I just don’t understand this trend at all, it’s just utterly narcissist self-promotion. All of these lot need to realise that posting YouTube videos is not conducive to their future career. don’t fall into the lion’s Den & then complain when you get ripped into shreds. The law of the concrete jungle prevails. What is it about law and attracting people who constantly need to validate themselves as the font of all knowledge – typically people whose only experience is a vac scheme or two? Lets be honest, becoming a lawyer is ultimately just about securing a job and then not messing up – it isn’t any more impressive than things like getting 3 A’s at A-level, getting into a good university, or getting into medicine or banking. Thousands of people do these every year – why do law students feel the need to brag? This. Aspiring Solicitors take note. Why oh why set yourself up for ridicule ? You secured your TC , wonderful , now just remove yourself from You Tube , keep your head down , and concentrate on preparing yourself for what is going to be bloody hard work .